In the world of social media, updates are a common occurrence. I mean, how can anything stay relevant and popular if it is stagnant in development and design? People today are attracted to what is popular; it’s what some would call the “Jones Effect.” Every heard of the Jones’s? Another way it is said is, “keeping up with the Jones’s.” If your neighbor down the street just bought a new car, you will think about buying one yourself, or even go out and do it. If you see your neighbor just put in a pool, chances are, you may wish you had one yourself, or even sign the contract to have one put in. The Jones Effect is, in other words, keeping up with the tide, staying relevant and modern without being left in the past. I know, a bit of a rant that may seem off topic, but look at social media today. Every social network is constantly updating its features, either mimicking already working functions or creating new and exciting features for their users. They are keeping up with the Jones’s. We all know about Twitter and how wonderful it can be for both personal use, as well as spreading your brand name. It seems though, that Twitter hasn’t been all that proactive, until now, with updating it’s usability. Updating the platform and the visual aspect is always appealing and nice, but functionality almost seemed stagnant. It is no uncommon that “leaks” or previews are spotted in the digital world. The developers of sites, especially ones as large as Twitter need to test how well their new feature will function, in real time, in action. So to get the proper feedback, they will active the new feature on a small percentage of user accounts, and gather data. Consider this a “trial run” of sorts. Here at PMC, we were lucky enough to have an account be fitted with these new updates, so what a better time to snap some screen shots and tell you about it? At first glance, you can already see that there is a difference in the main page. Now it says @username instead of @Mentions. In the new and updated Twitter, under the @username, it allows you to see who has mentioned you as well as who has started following you. If that’s not all, you can also see who has retweeted you, all in one feed. The biggest addition is the Activity tab. When you click on activity, you can see what all of the people you follow are doing. You can see who and what they have retweeted as well as who they have followed. Now I don’t want to step on anyone’s toes, but if you were to collaborate all of these feeds into one, do you think it would closely resemble the Facebook News Feed? I think so. This is just another way Twitter is keeping up with the Jones’s. 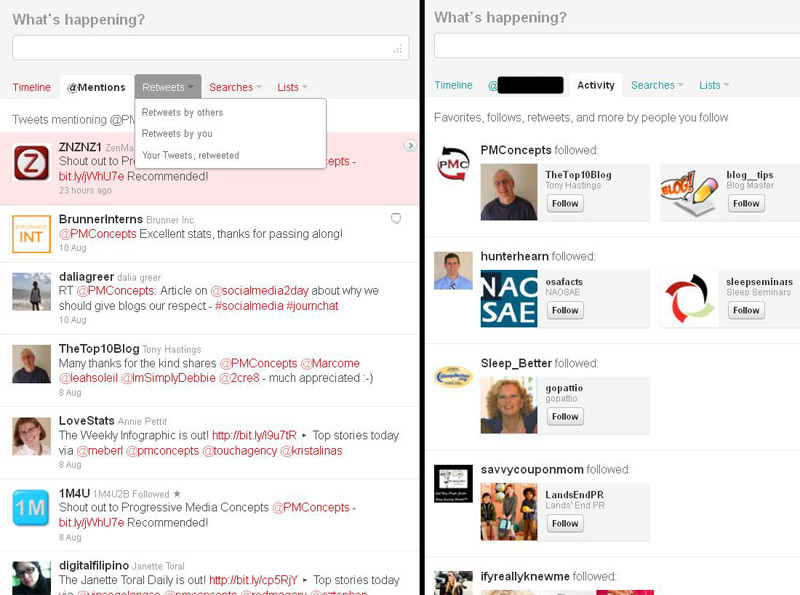 Making it easier to see what your followers are doing, and what they are saying about you. No more drop down menu, where you have to select what you want to see, whether it is your tweets retweeted or what other followers have retweeted. 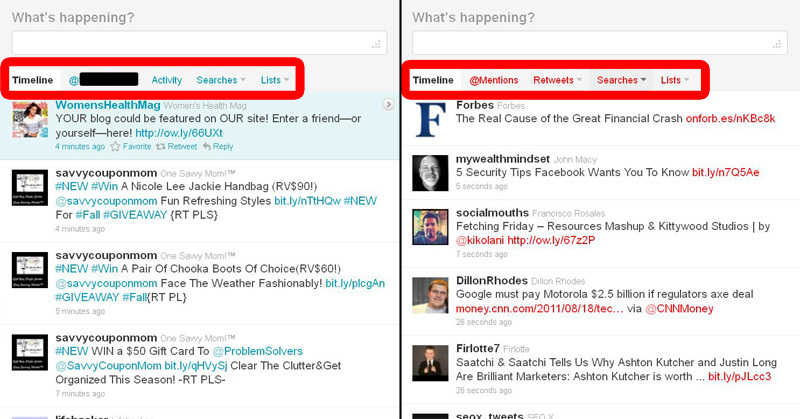 This new layout allows it all to be integrated into two feeds for ease both ease of use and visibility for the user. The release date for these new updates is still in question, but if you have been lucky enough to witness them, feel free to leave a comment with your thoughts. Twitter for business just got a bit easier when it comes to listening in on the conversation. We here at Progressive Media Concepts applaud the new features and feel it will improve the user experience with Twitter.